Thought that a review of these was in order since so many are buying them and there are always a lot of questions about the coilovers. I purchased these in the 3rd group buy so the price was 420 shipped. Price & Shipping - Perfectly fair. 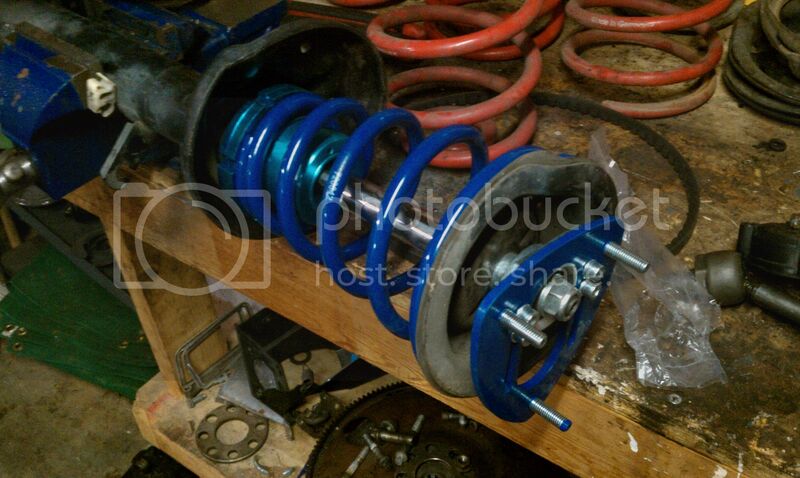 It came much faster than I thought it would and it's 420 dollars for shocks and springs. Not much to complain about here. Packaging - Fair but not great. Items are wrapped in paper and can move around so most of the paper was torn. One shock had popped out the end but upon arrival was back inside. There was no damage or chipped paint or the like. Not a huge problem but the box is huge compared to what shipped. Could save on packaging but I imagine the box is used for every coilover system they offer so say for an E36 you would get two complete struts and rear shocks. Quality - Value is the word I would start with here. You can tell these shocks are not Bilstein Sports. One with any sense would imagine this would be the case based on the price but wanted to get that out here. Springs appear to be of good quality and the paint on everything was well done. The adjusters are definitely cheaper metals and the threads are sharp. Lowest quality pieces of the set are the adjusters(more below). Shocks rebound and go up as normal. No dead spots, catches or dodgey operation. Installation - This is trick! No modification is necessary. I am sure most reading this have installed shocks on the E30. 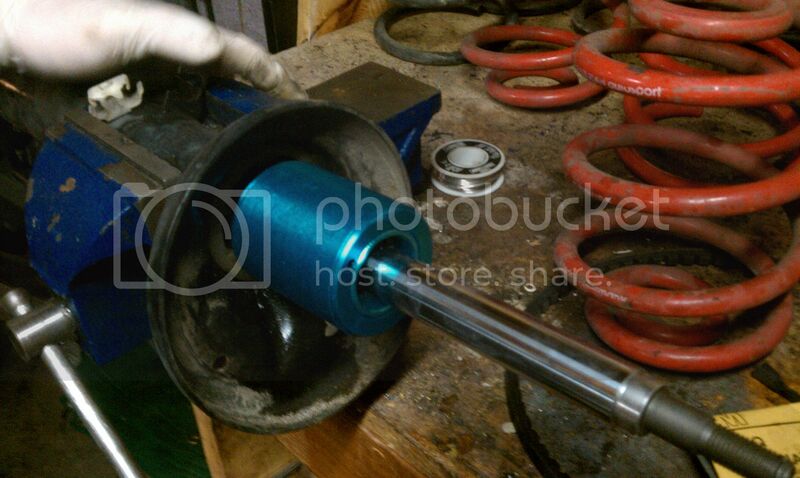 If not the shock goes inside the strut housing. It is held in with a threaded collar. You remove the OEM collar and the replacement is threaded from JOM. The shock fits perfect into the housing and you tighten down the new collar. The trick part? The new coilover sleeve now simply screws onto this. See photos below. All fit perfect. Zero issues. Adjust-ability(split into two parts) - Front - Crazy the level of adjustment. From my estimation you can go from stock ride height(or maybe higher) down to the point that you cannot even drive the car. I started halfway on the adjuster and it was almost tucking 14" basketweaves. Way too low for my uses. 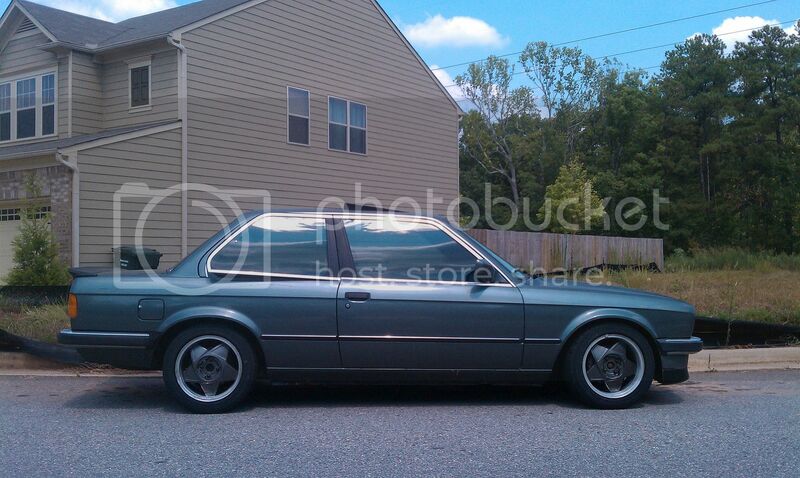 I raised it back up almost an inch and like it at that ride height. Rear - Not all that great. As many have said if you have a small bumper/late model car just running the rear spring should work out great. On an early model car don't even worry about trying it with the adjuster. There will be rear gap... with no adjuster. If you want to SLAM the car the fronts will be fine but you will want to get another rear spring for sure. Still if you need 2 rear springs at 180-200 dollars plus 420... the pricing is not bad. Now to the downside here. Fronts are difficult to adjust. Why? With the lower rear spring perch and the shock installed up into the strut tower there is not much room to work. This is where the quality level comes into play. It is easy to damage and mar up the adjusting collar with the tool provided. It took a good amount of time and effort to raise the front. Worth it in the end. The other issue and one you will want to watch out for is the threaded collar we discussed before that holds in the shock? Well it can and will start to back out as you adjust up. It would be best to get the ride height set out of the car... to not deal with this. If it loosens you will have clunks as the shock moves inside the housing. Fair warning. Ride Quality - This was the most surprising thing. It is quite good. I will say that just pushing down side by side with an IE3/Bilstein Sport car the JOMs are stiffer with what seems like higher initial valving on the shocks. Over rough terrain it is a little bouncy but hard to complain all things considered. I was super happy with the ride quality. Most surprising thing was the ride quality... and everyone that rides and drives the car comments on this. Performance - It's better than stock. It's not better than IE3/Bilstein sport or other performance setups. I have driven my previous E30 on IE3/Bilstein Sport and then custom Ground Controls. Both were more confidence inspiring. These you learn on them and they stiffen up and you power through the corner. Are they bad? No. Are they great? No. Final Thoughts - This setup is awesome when you consider the price, adjust-ability and what you receive. If you are looking for adjustable ride height on your daily driven that you like to toss around I would have no issue recommending this setup. It is great for that. I am 100% happy that I tested them out and a local friend of mine is purchasing them(along with my eBay camber plates I purchased). I am going to tuck my exhaust more and then run some custom coilovers. Since performance was what I was seeking first and foremost I want to run on something I know the results of and don't want to be messing with suspension. Pictures - Installation first two. 2nd is ride height with no rear adjuster or spring pads. Keep in mind that I did some poor math and went with 205.50.15 and my tires are quite a bit smaller than stock. With the 14" basketweave there was a MUCH smaller gap in the back. Beast mode review! Thanks for the detail and pictures. Glad everything was to your satisfaction! i concur with this man. Good review. Answered many of the questions I had about this setup. Thanks for the review! So in your finished height picture, is that as low as the rear can go? I just wanted to clear that up for anyone looking. Looks like a steller deal for people that cannot afford expensive GC setups. Keep in mind you would normally use your stock upper strut mounts. I put camber plates on mine. I have a set of RD springs.....in your opinion.....paired with new sport billies....which would be the better set-up on a 318is??? Not sure. Never ridden or driven on the RD Springs. This is a few days late but I autocrossed my car on these on Sunday. I have the 'vert kit with aftermarket camber plates and loved them. The car really stayed flat through the corners and wasn't bouncy at all. The only problem is there was a bit of wheel hop which I am assuming is due to the shocks not being stiff enough. Also, the rear didn't seem as it should be when you consider how stiff the fronts are. So some time down the road I MIGHT replace the shocks and get new rear springs. However, since the point of these coils are more for going low and better, not best, performance. These are great, especially for the money. If you are buying these solely for track performance, there are better options out there. If you want to drive your daily driver to the track and have a comfortable ride home, these are awesome. I am in 100% agreement and the same set up on a sedan. I have it on a sedan too. But now that I think about it, the 'wheel hop' I got could have been the product of having 500 front springs and 300 rear. So I'm definitely going to be buying some new springs for the rear and report back after some track days.